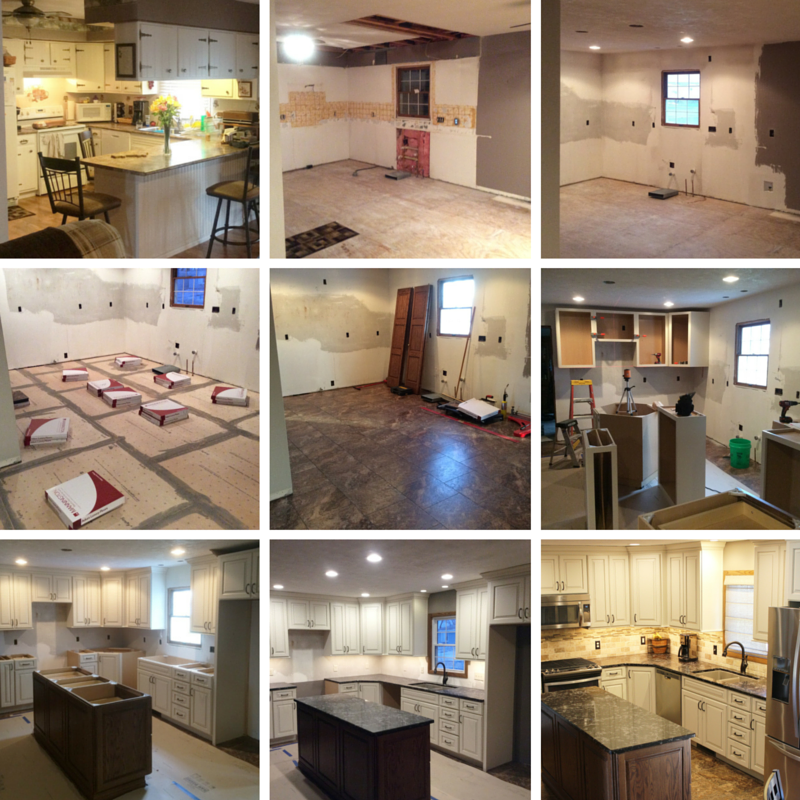 This East Moline, IL kitchen has been given a whole new look and layout. It is always so amazing when just a few location changes in a layout can make such a big difference for our clients. Look at how bright, beautiful, and inviting this new kitchen is. Before we show you around the new space let’s look at the “Before” part of this story. Like many kitchens in the area, this original space had soffits above the wall cabinetry. This was the desired look at the time the original kitchen was installed. A peninsula divided the kitchen area from the nearby dining space. A soffit and suspended wall cabinets hung and acted as a visual divider between the two spaces. This layout not only blocks traffic in a very busy area of the home, it also blocks a lot of light and sight from the kitchen into the nearby rooms. The new kitchen layout includes an island centered in the space and removes the peninsula. Now the kitchen, casual dining, and living room areas seem to be all one collective space with a more open concept. A large bi-fold pantry area was native to the original space. This pantry offers a lot of storage without intruding on the pathway from the formal dining room into the kitchen. 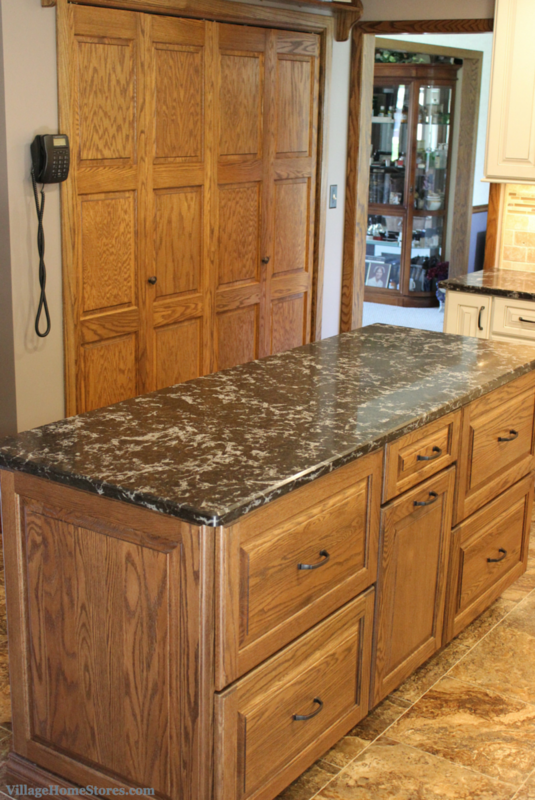 The new kitchen island was ordered in a finish to best compliment the medium oak stain on the pantry doors and trim. Koch Classic’s “Acorn” stain has been applied to a Red Oak wood. There could’t be a better complimentary finish to match the existing woodwork. 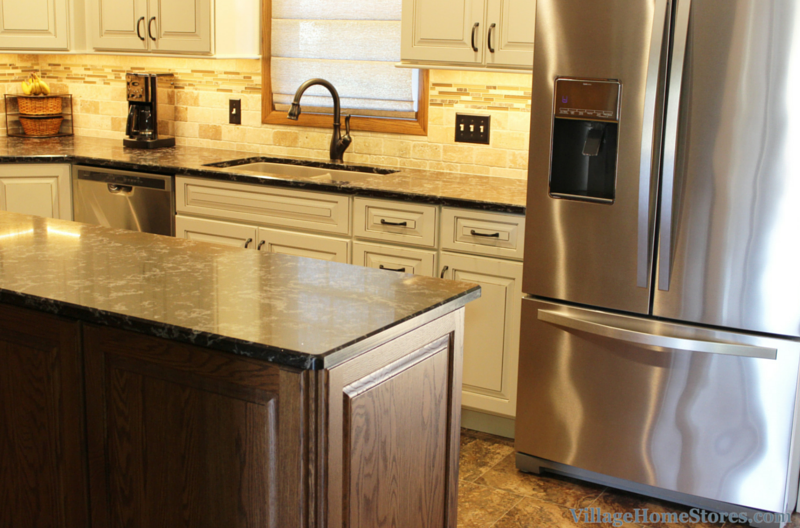 The island offers two large drawer stacks with a pull-out waste basket in the center. There is a lot to be said about creating a kitchen design that hosts an island without a sink or cooktop included in it. Think about how wonderful it would be to always have access to a large clear space to work on any type of project throughout the day. 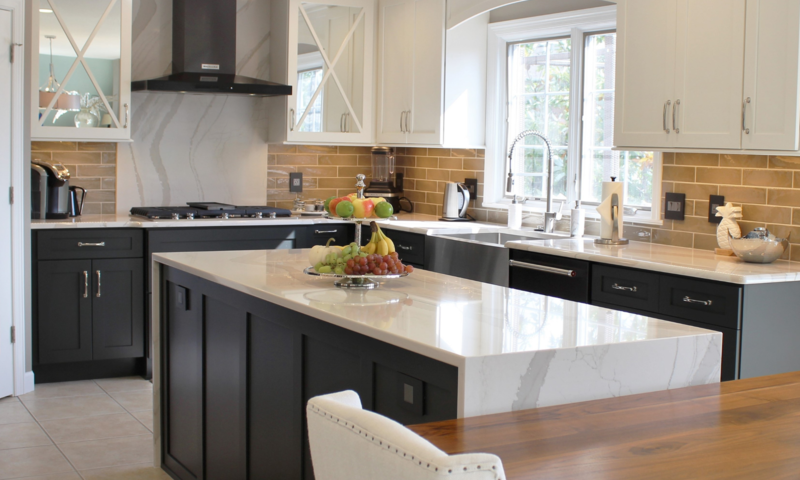 Including an Engineered Quartz countertop as the worksurface in the kitchen makes it a non-porous and durable surface to work on as well. 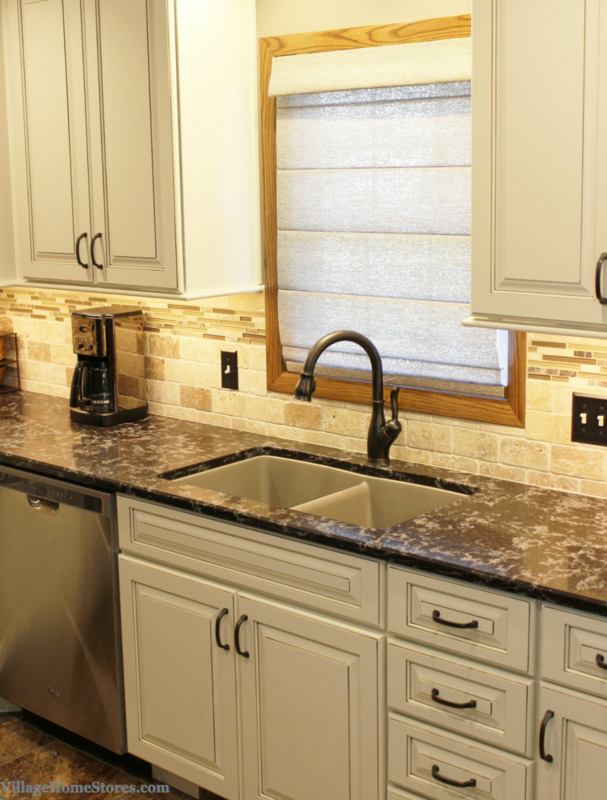 This color is called “Paydirt” from our Klondike series of quartz. 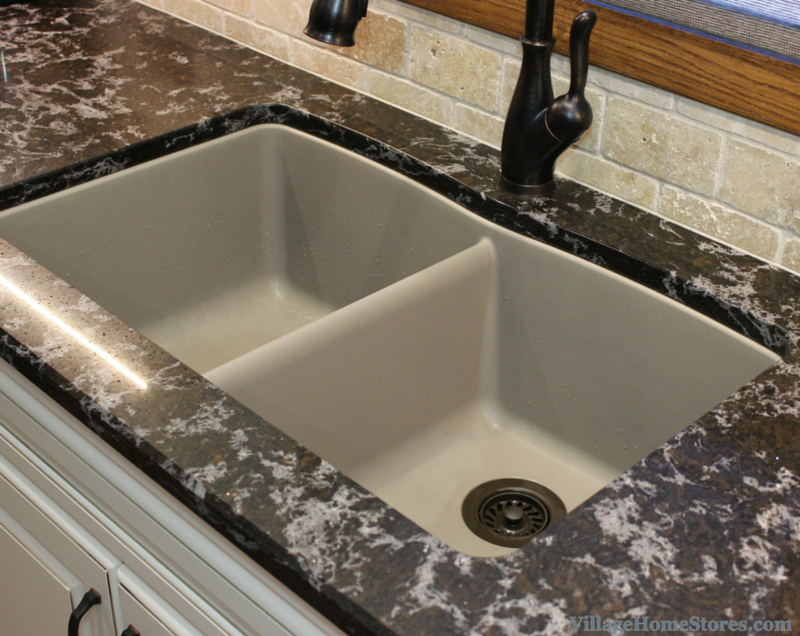 A “Beveled” edge profile has been applied to the quartz. 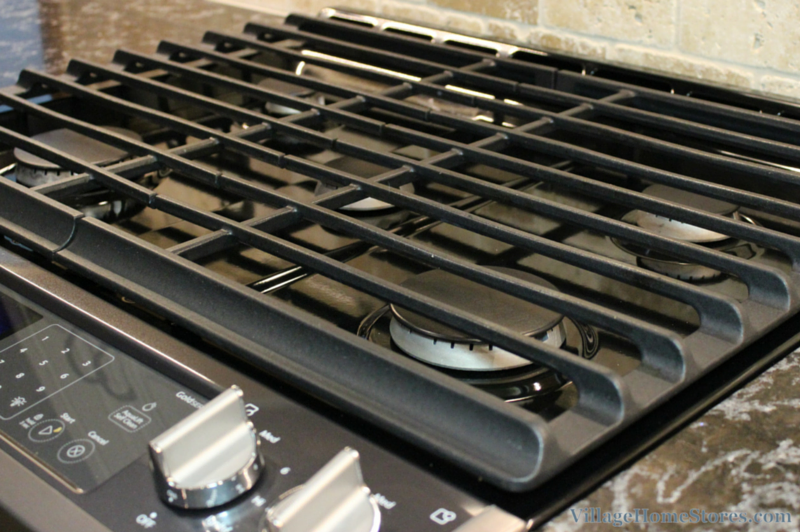 The cooking zone of the kitchen design is home to a freestanding slide-in gas range with convection and microwave hood by Whirlpool®. Replacing the older installation style that required a “sill” or “brace” of countertop behind the unit, these new ranges look sleek and built-in. The new freestanding models include front controls on the electric and gas units and a full-depth construction so they rest flush against the back wall. 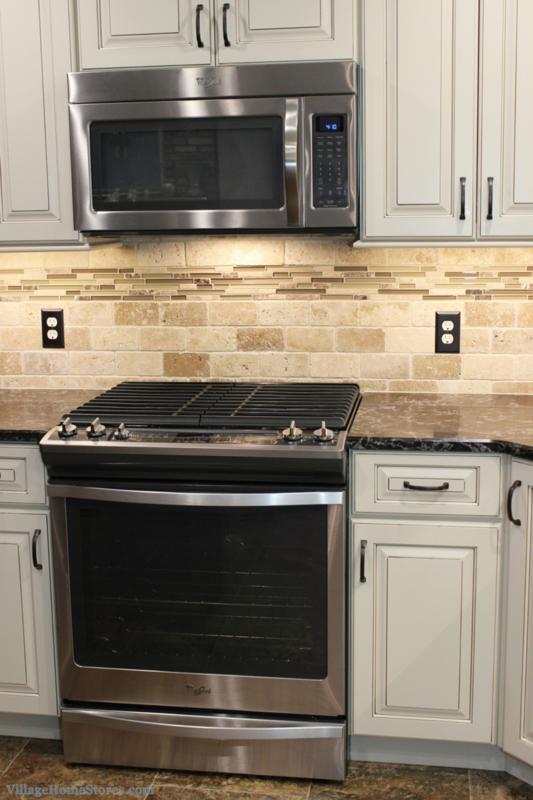 Your current freestanding range can be replaced with one of these units for a customized look. Any standard 30″ wide opening can accommodate one. 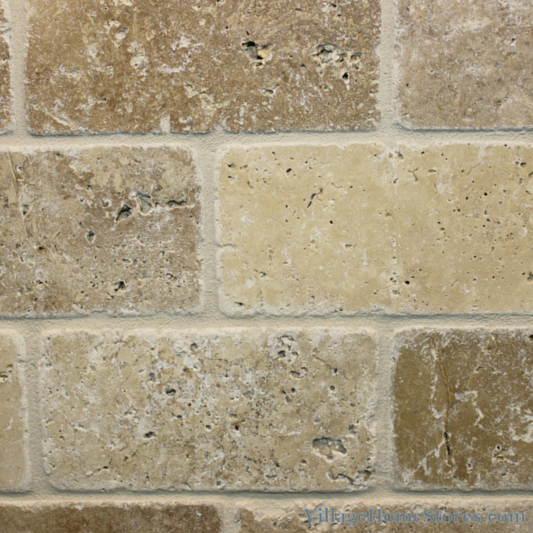 Take note that tumbled stone tiles like this Travertine can be installed and grouted to have two different finished looks. You can leave the natural characteristics of the tiles showing (shown to the right) or choose to fill in the gaps and crevasses with your grout. Be sure to discuss the finished look you are after with your tile installer before they begin the project. The texture and style that this backsplash adds to the finished space is showcased by our Diode LED undercabinet lighting system. We have found that this lighting system is a key element to a successful finished remodel project. Our customers are always so glad that they included it in their design. Even during the daytime hours, it is difficult to imagine this kitchen without that backsplash and countertop getting the lighting they deserve. Press play below to see how lost the tile looks when the lights turn off. The Project Management team replaced the original kitchen window with a new double-hung unit. 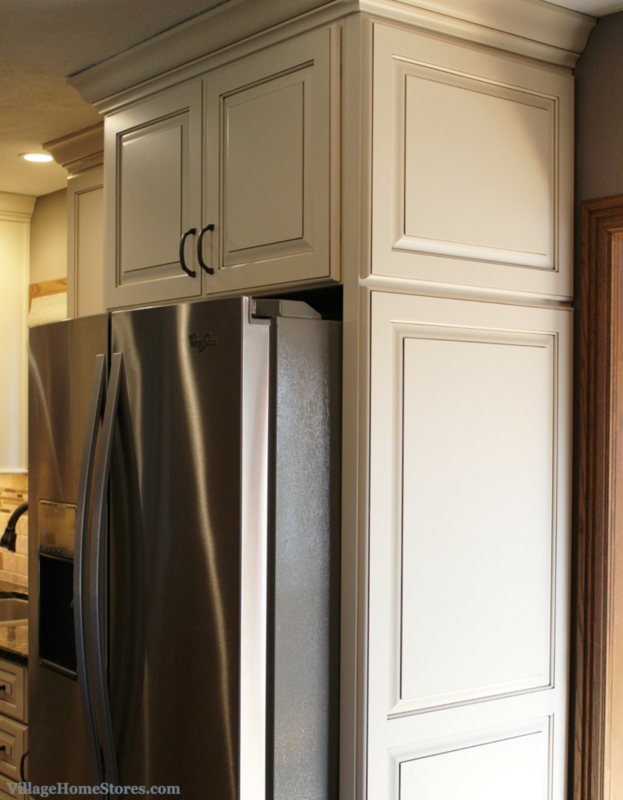 The main perimeter cabinetry for the kitchen is a bright painted finish called “Pearl”. An “Umber” highlight glaze has been applied to the “Seneca” doorstyle. Soffits have been removed and the new wall cabinets stretch all the way to the ceiling with crown molding applied at the top. 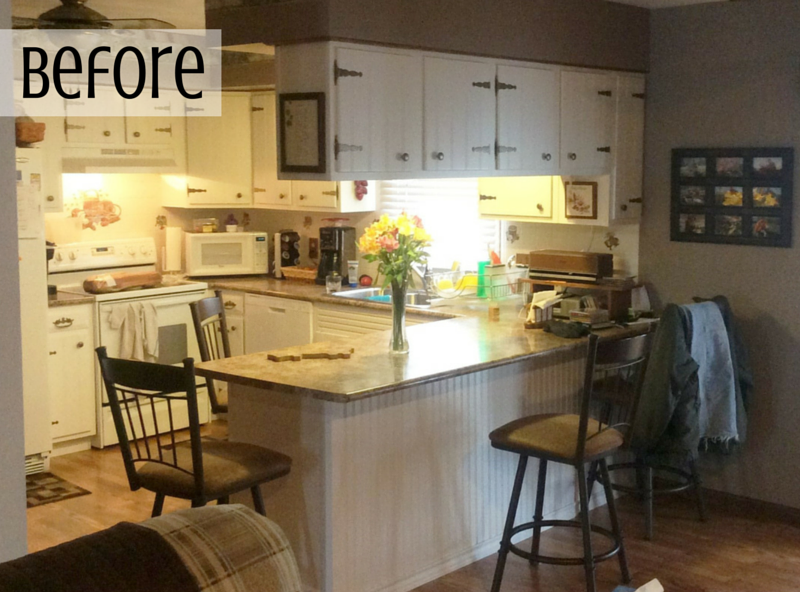 This grants more available storage space in the wall cabinets and an updated look. The new layout feels far less cramped now that the peninsula doesn’t cut off the kitchen from the rest of the room. 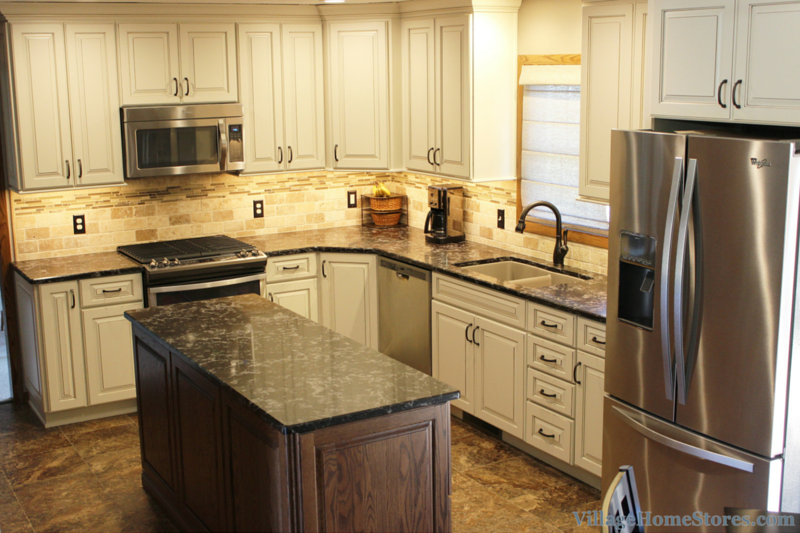 It is as though the same counter space from the original kitchen peninsula has been shifted into an island top that is now easier to access and use for many tasks. The kitchen sink on the perimeter of the kitchen is an under-mounted model by Blanco in a “Truffle” finish. A 50/50 split layout (shown below) is just one of the many options you have available to choose from when selecting an under-mount sinks. 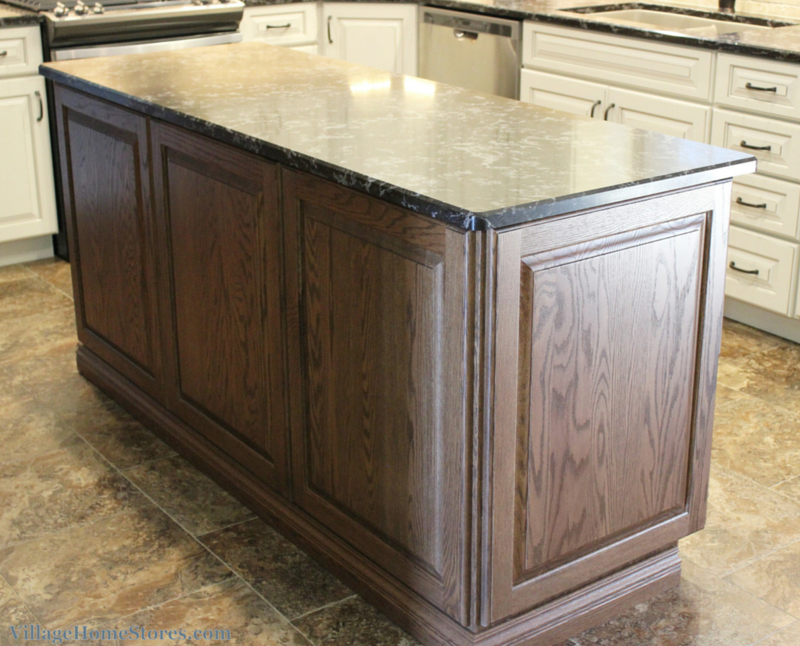 The island has been finished off with an applied door look on each end and spanning the full back panel side of the island. That same treatment has been applied to the refrigerator end panel that caps off the end of the new kitchen. This end treatment option creates such a polished and customized look. A smooth end panel would not give the opportunity for any of the highlight glaze to be applied. With the sunlight that pours in from a set of french doors next to it, this paneled look is a perfect detail! The refrigerator was moved to this new location from the opposite corner. Now the cooking center is open and not crowded. There is plenty of landing space to load and unload the refrigerator. New flooring was installed in the living room and the new kitchen. Luxury Vinyl Tile by Mannington called “Corsica Cavern” perfectly ties all of the kitchen finishes together and warms up the space. LVT gives you the look of ceramic tile but a softer surface to work on and warmer to your bare feet. Learn more about LVT here on a previous blog post. 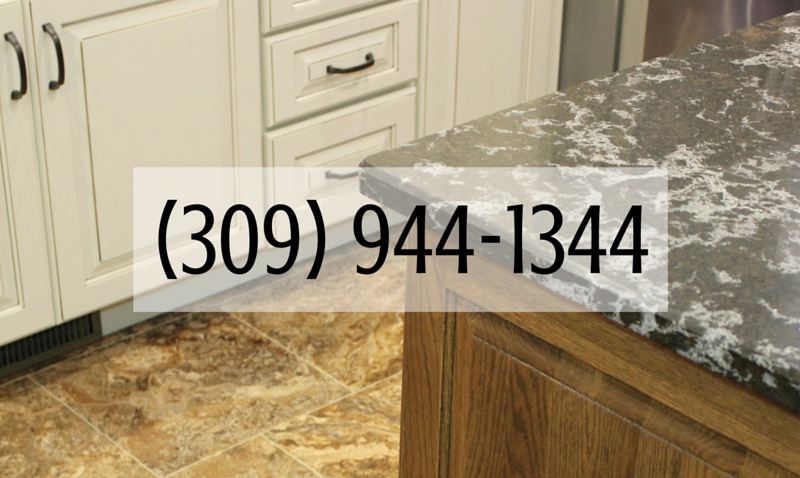 Do you have a kitchen in the Quad Cities region that is in need of a complete remodel? 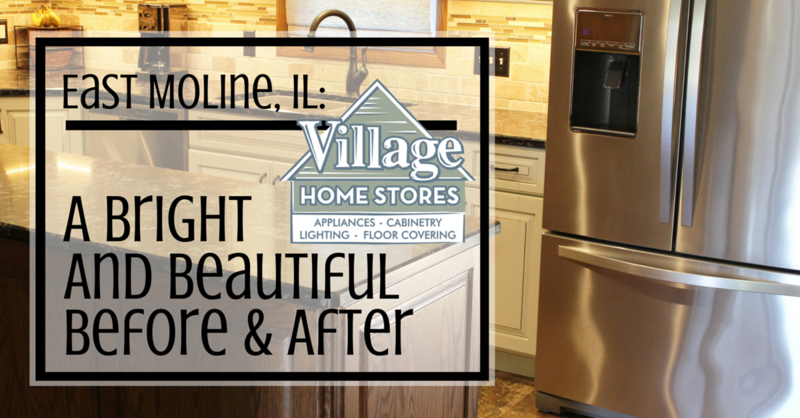 Village Home Stores would love to be a part of your own before & after story. We can provide design and materials for your space or manage to project for you entirely. Whatever works best for your lifestyle and budget. Contact us today to schedule an appointment with one of our designers and start the conversation. (309) 944-1344.